On the site of a residential property development, a substantial earth moving operation was required to achieve the correct topographical levels and necessitated a 4m high cutting in the terrain. This left a high, exposed earth bank adjacent to the properties with mounting concern that the loose structure of the bank, which included large slate deposits, could collapse, especially in wet conditions. After assessment of the site Weber's technical experts advised the use of webercem spray DSF to cover and stabilise the earth bank. webercem spray DSF is a ready to use, polymer modified, cement-based mix containing inert limestone aggregates and dust suppressants. It contains alkali resistant glass fibres providing good strain relief and stress distribution which reduces the risk of shrinkage cracking. This product is designed to give high tensile strength; reduced rebound on application, meaning wastage is minimised, and application thickness can be controlled. The assessment of the ground in this project indicated that it would not be necessary to use wire mesh as a reinforcement as the fibres in webercem spray DSF are designed to form a cross hatch, matt effect which achieves strength and stability. Equally, the undulating surface of the sprayed concrete without wire mesh better reflected the natural effect of the ground at this location, rather than the flat appearance had mesh been used. A limited number of rock angle pins were driven into the larger rocks to give a key point to the sprayed concrete. The face of the bank was scraped down to remove dust and algae prior to spraying. Access to the site was difficult but the high pressure pumps enabled hoses to be run to the spraying tower as the process moved along the 16 metre run. 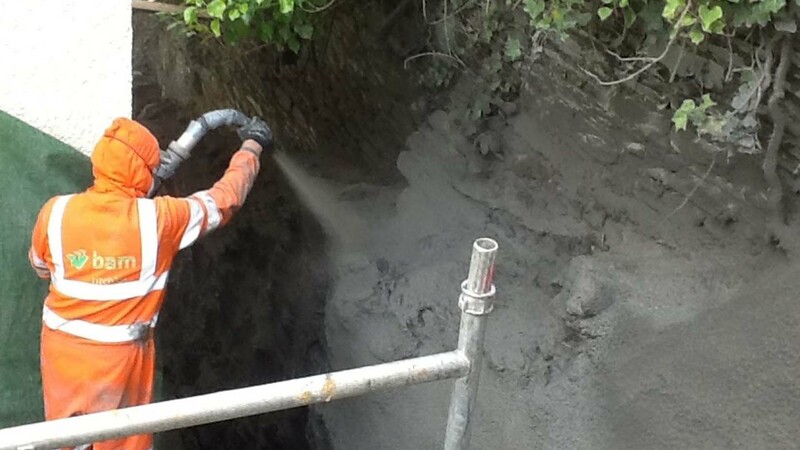 Eight tonnes of webercem spray DSF were required to build a surface cover of between 50mm and 100mm across the banking. This product has high-build capacity of up to 150mm thickness which can be applied in one pass on vertical and overhead faces without additional mesh reinforcement. Patrick Carden, project manager, BAM Ritchies, stated "The webercem spray DSF worked very well. It is an excellent material and this was the first time we have used it for this type of application but the resulting finish is strong, stable and looks very good. Our client is very pleased with the job." webercem spray DSF is safe to use and handle, with relatively low dust emission. It has low permeability to water and chlorides and complies with Highways Agency specifications for repairs to highway structures. webercem spray DSF provides protection of reinforced concrete marine structures and is a Class 4 repair product that meets the requirements of BS EN 1504-3.